Time for a change | Twende pamoja! Y – You’ve got what it takes! This week has brought a lot of change. First up, my age changed! Wednesday was my 30th birthday and with it came possibly the most excellent birthday card I’ve ever received from the Finance Manager at work. But the whole day was brilliant. It started with an awesome treasure hunt, organised by friends who had recently visited, that had me crawling on hands and knees round my flat at 6.30am and ended in me being late for work. 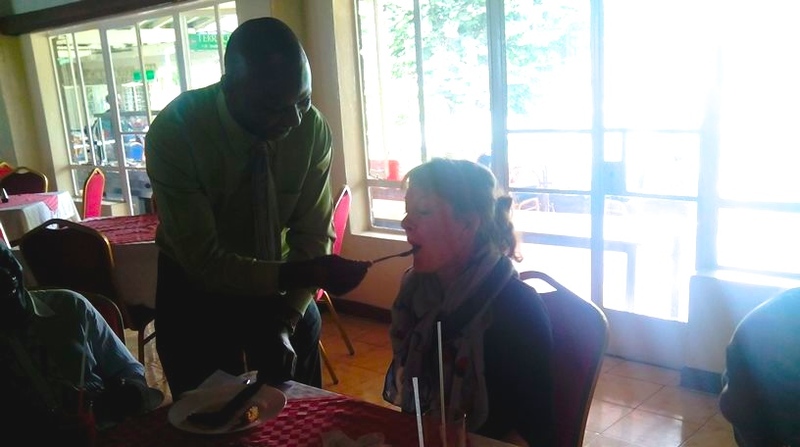 The afternoon brought a mini party at work with cake, acrostic poetry recitals (see above), prayers, inappropriate bible translations, discussions about what it means for a wife to submit to a husband, and being spoon fed my first piece of birthday cake by a colleague. A typically bizarre event, I would have expected nothing less. The day was rounded off with dinner at the local pub, a birthday drink courtesy of my favourite waiter, and an invitation to make hand-made soap with aforementioned waiter. Second…up (?! ), my whole world out here changed. I left my VSO placement. I didn’t have the faintest clue I would be writing this a month ago. Back then I was writing an annual report, planning strategy workshops, working out how to nudge a funder along to making a decision. But I also wasn’t very happy or satisfied. Not in a terrible way or anything. Just in a frustrated, confused and slightly worn out way. Leaving a VSO placement early, it must be said, is not generally seen as a good thing. VSO pump a huge amount of resources into getting a volunteer out to a placement and the training is strongly designed to help you expect and manage the frustrations that will arise. When I came out here in November last year I had literally every intention of sticking with my role through thick and thin. From day one, I’d been prepared to accept relentlessly difficult and hard-won progress with my placement’s objective to “build organisational capacity in fundraising”. I wasn’t let down! But the thing was it wasn’t just that the work was hard. I was pretty isolated, both physically sitting in an office on my own and, increasingly, in terms of lacking the working relationships that were needed. I don’t have a problem working independently, but I do have a problem with turning up to an empty room day after day and I really had a problem with a colleague turning up to see me, in tears, explaining that office bullying meant she couldn’t be seen to be working with me anymore. It wasn’t soon after that, one night after eight months of trying, I realised things weren’t going to dramatically change. And the thought of spending another four months in this unmotivated and draining state wasn’t going to do much good for my employer or me. So, with the decision made things have moved quickly. On Friday I shut the door to my office, locked the massive security grill and said goodbye to my colleagues who have been among my favourite part of being in Kenya. Now onto the next chapter… which doesn’t mean hopping on a plane just yet! Thanks to kind friends… and instant-access ISAs… I’ll stay in Kenya until Christmas and have a host of projects and volunteer fundraising work to get on with including starting a fashion-line in light-up dresses (available on mail order soon). N.B. The rest of this post is probably more of interest to future and current VSO volunteers. So you can stop reading if you’re friends and family! Quitting isn’t something many people find easy. Whether it is a bad habit, a job they once loved, or a relationship. I definitely had the mindset that to quit my VSO placement early was to fail and I really didn’t want to put myself in that boat. I also imagine that most volunteers have had moments when they wanted to give up. I’ve read some wonderful blogs from other volunteers about this very issue and the “turn-around” moments they have where a small but significant success gives them the energy to keep going (My favourite: http://missmakinrwanda.blogspot.com/2014/04/super-long-rant-reason-for-tears.html). Unfortunately, I just had too few of these moments. When things started to stall at my placement I spent quite a lot of time telling myself that I was the problem, I wasn’t demonstrating enough of those fabled selection characteristics – “flexibility and adaptability” – and until I could definitively say I had tried everything then I couldn’t give up otherwise I only had myself to blame. That mantra was a whole bunch of fun as I’m sure you can imagine. Eventually I realised that regardless of where the blame for things going wrong lay, those things weren’t changing. But now, despite feeling slightly deflated by the experience, I can still say I wouldn’t have missed it for the world. Working for a local NGO with a set of colleagues who were all Kenyan has given me an insight into life here that I can’t imagine I could have gained any other way. This year has been one my most memorable, incredible, informative, eye-opening and heart-warming. More significantly, I don’t think it has been a one-way street in terms of benefit. I’d feel pretty bad if I’d been the only party to gain out of the time so it means a lot for me to be able to share the anecdote below. THAT’S why I still love VSO. That’s why I can say without a moment’s hesitation I would still recommend volunteering with VSO to anyone and everyone. And that’s why I don’t consider my finishing early as a failure anymore. The advice? Don’t be afraid of quitting. Do it quickly. Do it often. And let yourself find the activities and opportunities which allow you to shine and contribute. No one is winning otherwise.